One of the gifts of life we have taken for granted is the internal plumbing of the body, of which the immune system is an integral part. The organisation of our immune system, for the most part, works silently behind the scenes to protect the integrity of our body from attacks from within and from without. In order to do so as efficiently and effectively as possible, we have an intricate network of drainage pipes and filters the constantly samples and screens the internal milieu of our tissues. Before we look at this screening process in more detail, we need to understand how the tissue fluid that surrounds our tissue cells get there in the first place, and how the drainage pipes and screening filters are strategically placed to protect our body when there is potential harm to the integrity of our tissues and our bodies. Let us now zoom out from our cells and take a brief look at the circulatory system that consists of the heart and its plumbing. The heart is the pumping station of the body that creates a blood pressure gradient which directs the circulation of blood containing oxygen and nutrients to all cells of the body and this is effected via a network of delivery pipes called arteries. These then divide into a network of smaller distributing pipes called arterioles that in turn divide into capillaries. Is is from these vessels where oxygen and nutrients diffuses from the blood into the tissue fluid that nourishes our tissue cells, and from where carbon oxide and other waste products of metabolism diffuses back into capillaries. These capillaries then coalesces into bigger pipes called venules that coalesce further into veins which return blood back to the heart. From here it is pumped back to the lungs to exchange carbon dioxide for oxygen, to the intestines to exchange nutrients for some waste products, to the liver for storage of energy, detoxification and excretions of more wastes, and to the kidneys to excrete excess fluids and other waste products of metabolism. It is the sum total of these activities that ensures that the microenvironment of the tissues that are bathed by the fluid have the optimal amount of oxygen and nutrients and a minimal amount of toxic waste products of metabolism. From time to time, the tissues become damaged from wear and tear, are injured by foreign invaders like viruses, bacteria and fungi, and their integrity become compromised by cells going rogue and not behaving harmoniously with the other normal cells in the tissues that surround them and support them (i.e becoming cancerous). There are resident immune cells that detect these forms of injury, and when they are activated by these signals that may portend danger to the integrity of the tissues, they begin to mobilise. These cells then migrate via a parallel network of distributing channels to organising and processing centers called lymph nodes. As a result, our bodies have a second network of parallel pipes similar to our sewage disposal and collecting systems. These drainage pipes are called lymph capillaries that constantly sample tissue fluid surrounding tissue cells and these in turn drain along with the activated and mobilised immune surveillance cells to lymphatic vessels. The fluid, debris and immune cells in the afferent lymphatic vessels then drain into the lymph nodes where the sampling of the draining tissue fluid are performed again by other resident cells of the immune system, where signals of tissue damage, pathogenic invasion or rogue activity are further processed and the information consolidated. This sampled and screened fluid in addition to the other immune cells that have become further activated and mobilised then leaves the lymph nodes via efferent lymphatic vessels. The lymph nodes then interconnect with each other as shown below and eventually the fluid and activated and mobilised immune cells return back to the blood circulation via the thoracic duct. Each region of the body drains to a particular group of lymph nodes downstream. Also, if there is an increased activity in the lymph nodes, then this signifies that there is some increased abnormal activities in the region upstream form which they drain. 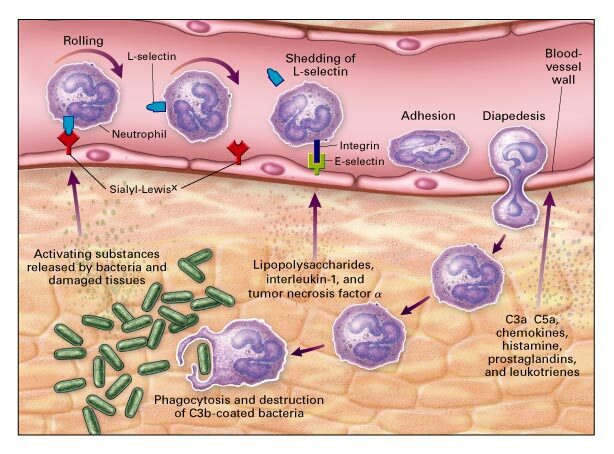 Once in the blood stream, the immune cells then circulate and then traverse the local blood vessels that have been also activated to express homing receptors in the region of the damaged tissue where they then consume bacteria, virus infected cells, cancer cells and their cell debris, and it is at this point the tissue begins to heal from the tissue injury. All of our immune cells are born in the bone marrow, and before they are released into the blood stream to become resident in the lymph nodes, they have to be selected so that they can only be activated against foreign invaders and cells that have gone rogue, and not against their own healthy cells. In order to accomplish this task, they have to be taught first what is self and what is not self, or in other words, what is life-enabling and what is life-disabling. In order to anticipate the largest diversity of non-self and potentially life-threatening circumstances, the T cells each develop their own unique identity and manifest unique receptors of engagement (TCR) that collectively can recognize all possibilities. This pool of T cells are then matriculated to identify what is self and thus life-enabling and selected for, and those that are not able to recognize self do not survive and move on to the next selection process. This process is called positive selection. It would be a waste of potential and resources to have cells floating around that cannot recognize self. Having been positively selected to identify self, T cells that have the capabilities to react with and become activated to induce damage to self are selected against and deleted from the pool. This process of matriculation is called negative selection. Only those T cells that can recognise self but are turned against self are released from their primary schooling apparatus and graduate as they continue to mature and seed to take up residence in the peripheries (such as the lymph nodes and spleen). The mature T cells are now poised to recognize damaged tissue that are caused by foreign invaders and rogue cells. This occurs when tissue fluid draining into the lymphatic channels are filtered, sampled and screened by other cells in the lymph nodes that are able to present these life-disabling information so as to active and mobilise the T cells to definitive and strategic action. The repertoire of T cells is shaped by both positive and negative selection. T-cell receptors (TCRs) are generated by random gene rearrangements. In the thymus, those T cells with TCRs that are unable to recognise self major histocompatibility complex (MHC) molecules are allowed to die, because they will not play a useful role in the immune system. The T cells that remain are ‘positively selected’ for further development. Many of these positively selected T cells recognise self MHC molecules with such a high avidity that they would be autoreactive and capable of causing autoimmune disease. These T cells are deleted (i.e. they are killed) in the thymus by negative selection. The remainder (probably <5% of those that originally entered the thymus from the bone marrow) are allowed to mature and enter the peripheral immune system. With regards to the rogue tumour cells, that are potentially life disabling, the immune system plays an important role in eliminating them as they arise. For the most part, this immune surveillance is successful, but sometimes the tumour gets an upper hand, and an equilibrium in the struggle for survival develops, and the tumour is kept at bay by the immune system, and is preventing from progressing further and doing any harm. Unfortunately in some cases, some of the immune cells facilitate the growth and escape of tumours and instead of becoming part of the solution becomes part of the problem. The details of this process is summarised in the 4 graphics below. Elimination is a phase of cancer immunoediting where both the innate and adaptive immune system together detect and destroy early tumors before they become clinically visible. Normal cells (blue) are transformed into tumor cells by carcinogens and other genotoxic insults along with the failure of intrinsic tumor suppressor mechanisms (e.g. p53, ATM). These tumor cells express stress-induced molecules such as surface calreticulin, tumor antigens in context of MHC class I molecules, and/or NKG2D ligands recognized by CD8+ effector cells and NK cells, respectively. DCs can also take up and cross-present tumor antigens to T cells including NKT cells (glycolipid antigens presenting via CD1d). These activated effector cells release IFN-γ that can mediate anti-tumor effects by inhibiting tumor cell proliferation and angiogenesis. CD8+ T cells can induce tumor cell apoptosis by interacting with Fas and TRAIL receptors on tumor cells, or by secreting perforin and granzymes. Effector T cells express co-stimulatory molecules such as CD28, CD137, GITR, OX40 that enhance their proliferation and survival. γδ T cells can also recognize and kill tumors expressing NKG2D ligands (MICA/B in humans). Innate immune cells such as macrophages (M1) and granulocytes also contribute to anti-tumor immunity by secreting TNF-α, IL-1, IL-12 and ROS. In the Elimination phase, the balance is towards anti-tumor immunity due to an increase in expression of tumor antigens, MHC class I, Fas and TRAIL receptor on tumor cells and perforin, granzymes, IFN-α/β/γ, IL-1, IL-12, TNF-α in the tumor microenvironment. In the Equilibrium phase of cancer immunoediting, the immune system holds the tumor in a state of functional dormancy. Some tumor cells undergo genetic and epigenetic changes and due to constant immune pressure, tumor cell variants evolve that resist immune recognition (antigen loss or defects in antigen-presentation) and induce immunosuppression (PDL1). The Equilibrium phase is a balance between anti-tumor (IL-12, IFN-γ) and tumor promoting cytokines (IL-10, IL-23). The adaptive immune system is required to maintain tumor in a functionally dormant state while NK cells and cytokines such as IL-4, IL-17A and IFN-α/β are dispensable. During the Escape phase of cancer immunoediting, the immune system fails to restrict tumor outgrowth and tumor cells emerge causing clinically apparent disease. In this phase, tumor cells evade immune recognition (loss of tumor antigens, MHC class I or co-stimulatory molecules), express molecules of increased resistance (STAT-3), survival (anti-apoptotic molecule bcl2) and immunosuppression (IDO, TDO, PD-L1, galectin-1/3/9, CD39, CD73, adenosine receptors) and secrete cytokines VEGF, TGF-β, IL-6, M-CSF that enhance angiogenesis. Furthermore, MDSCs, M2 macrophages and DCs may also express immunoregulatory molecules such as arginase, iNOS and IDO and secrete immunosuppressive cytokines IL-10 and TGF-β that can inhibit CD8+ proliferation or induce apoptosis. MDSCs and IDO expressing DCs also induces the generation of regulatory T cells. IDO, arginase, CD39 and CD73 are immunoregulatory enzymes whereas IDO catabolize tryptophan to kyneurenine, arginase catabolize L-arginine to ornithine and urea, CD39 metabolise ATP to AMP which can further be metabolised to adenosine by CD73. Adenosine can bind to adenosine receptors — A2aR and A2bR expressed on tumor cells, endothelial cells and immune cells. T cells including Tregs may express inhibitory receptors such as PD-1, CTLA-4, Tim-3 and LAG-3 that suppresses anti-tumor immune response and favor tumor outgrowth. In the Escape phase, the balance is skewed towards tumor progression due to the presence of immunosuppressive cytokines and molecules such as IL-10, TGF-β, VEGF, IDO, PD-L1. The big question that is being explored now by medical science are the determinants that influence the outcome of these life-disabling rogue cells. That is, what determines whether the tumour cells are eliminated, become equillibrated with, or escape from the immune surveillance mechanisms? We now know that stress plays a major part in controlling the expression of genes in our immune cells via our endocrine system and sympathetic nervous system, which are the two modes of communication and coordination of the different cells, tissues and organs of the body. What is also being recognised is that our stressful social circumstances may not only suppress and handicap our tumour immunosurveillance system, but also by exacerbating inflammation inappropiately may even be responsible in some cases for the genetic damage that is responsible for the initiation of some cancers and their progression. Even more revealing is the fact that inappropriate inflammation in our arteries may cause their blockage and narrowing and also lead to many of the non-communicable disease of our essential organs such as our heart and brain. Fig. 1. Exogenous control of human gene expression by stress. Central to human social genomics is the fact that social-environmental conditions, especially our subjective perceptions of those conditions, can reach deep inside the body to regulate the expression of broad sets of genes, or gene profiles. Receptors on the surface of cells “hear” extracellular signals from the endocrine and sympathetic nervous system, which respond to social experiences such as social isolation and rejection. Intracellular transcription factors, including the cyclic AMP response element-binding protein (CREB) and the glucocorticoid receptor (GR), then relay the signal to the nucleus of the cell, where the transcription factors bind to gene promoters and upregulate the transcription of DNA into mRNA. mRNA is then translated to produce amino acid sequences that form the basis for a wide range of proteins that influence human health and behavior. Individual differences in sensitivity to social context is influenced by the fact that several factors, such as a person’s genotype, can affect the binding of transcription factors to promoters, thereby influencing the likelihood that a particular signal results in gene transcription. Because only genes that are transcribed into RNA actually shape health outcomes and behavioral phenotypes, any process that influences transcription factor binding affinity (e.g., polymorphisms, methylation, histone modification) can substantially affect a person’s propensity to develop certain diseases or traits. Fig. 2. Conserved transcriptional response to adversity (CTRA). The CTRA emerges from neurobiological activation of leukocyte inflammatory genes and inhibition of innate antiviral genes in response to subjectively experienced physical or social threat. This proinflammatory skewing of the leukocyte basal transcriptome would be adaptive in response to physical threat, given that such threats were historically associated with increased risk for wounding and bacterial infection. However, social, symbolic, or imagined threats occurring in the contemporary social environment can also activate the CTRA, which maladaptively deflects host defenses away from the now more prevalent threat of socially mediated viral infections and toward the now diminished threats of injury and bacterial infection. Because the CTRA can be activated by imagined social threat (i.e., in the absence of actual physical threat), chronic activation of the CTRA can occur, which promotes the development of several inflammation-related conditions, including cardiovascular disease, depression, metabolic syndrome, neurodegenerative disorders, and certain neoplastic diseases. These psychiatric and physical conditions cause substantial morbidity and dominate modern mortality. Fig. 3. Human social signal transduction. Social signal transduction is the process by which subjectively perceived social conditions and historically and developmentally derived anticipatory worries alter genomewide transcriptional dynamics. (a) Social-environmental threats are neurocognitively appraised and converted into changing patterns of activity in the sympathetic nervous system (SNS) and hypothalamic-pituitary-adrenal (HPA) axis. Neuroeffector molecules from these systems engage specific gene transcriptional programs in differing target cells. In leukocytes, for example, SNS and HPA signaling suppress innate antiviral genes (e.g., IFNA, IFNB), whereas SNS signaling activates, and HPA signaling inhibits, proinflammatory cytokine genes (e.g., IL1B, IL6, IL8, TNF). (b) These processes can also be depicted conceptually, highlighting the fact thatsocial experiences can become biologically embedded in at least two ways. First, internal physiologic recursion can occur, given that the genes targeted by social signal transduction pathways encode the molecules that mediate social signal transduction (e.g., receptors, intracellular signaling molecules, transcription factors, and growth factors). This recursive process propagates experienced-induced transcriptional alterations forward in time by sensitizing signal transduction pathways to the external social environment. Second, external social recursion can occur, given that social signal transduction can modulate genes involved in the regulation of social behavior (e.g., defensive responses to perceived threat). This recursive process takes place when conspecifics in the surrounding environment change their behavior in response to an individual’s altered actions, locking the individuals in a reciprocal feedback system. These two pathways give social-environmental experiences the ability to influence the basal cellular transcriptome for weeks and years after the initial environmental impetus has passed. ACTH = adrenocorticotropin hormone; ADRB2 = β2-adrenergic receptor; CRH = corticotrophin releasing hormone; PRR = pattern recognition receptor. Hopefully at this stage, you would have developed a better awareness, understanding, appreciation of your immune system and how our internal plumbing and immune cells work together to ensure that the integrity of our tissues are preserved and life-enabling and how they spring into action to identify and remove any activity that is life-disabling. The lessons learnt can be used to model the development of a form of social organisation that are based on the same principles of a network of channels to monitor, sample and screen for activities at the local level that are life-disabling, and then to have network of individuals that can be activated and mobilised to assess and deal with those activities that are life-disabling. Also, our matriculation system should during the formative years be responsible for teaching us and selecting for the principled criteria that help us to gauge and engage in activities that are life-enabling , and helping us to reject activities that are life-disabling. This is important to help us from developing autoimmune activities that ends up attacking self (all that is life preserving and enabling), and priming us to maximise our potential to detect and eliminate activities that are life-disabling and with the potential to escape our abilities to control their growth. In the next blog article, I will show that it is time now to take stock of our true life capital. By shining the light on their decouplings, which have been kept in the dark for far too long, hopefully we can make our systems of social organisation more life enabling and whole again.